The half-marathon in Barcelona, also known as the Mitja Marató de Barcelona, is held every March. It’s the second largest running event in Barcelona next to the Marathon. The next half-marathon takes place on 11 February 2018, and is also open to wheelchair users. The 21,0975 km long route takes the runners from the Arc de Triomf, by the old town to the Plaça Catalunya. From there it goes down the famous Ramblas and along Avenida del Paral·lel. Then it goes through the modernist Eixample district back to the Arc de Triomf, Parc de la Ciutadella further along the eastern part of Eixample to the Torre Agbar, one of the most striking buildings in Barcelona. The route takes the runners along the Diagonal then goes to the Fòrum and along the beach again at the Parc de la Ciutadella to Arc de Triomf, which is the finishing line. With this route a very interesting and varied street circuit is marked out. 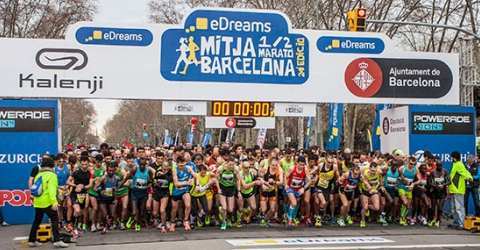 You can register online on the official site of Mitja Marató de Barcelona. A transponder chip is required; it can be purchased at registration for €3.00. Up to the first 12,000 registrations, the registration fee amounts is €24.95 with your own chip or €28 without your own chip. From the 12,001 registrant the fee is €29.00 respectively €32.50. A walking bag and the official Mitja Marató T-shirt are included in the registration fee. Registration for the half marathon for wheelchair users: write an e-mail to info@edreamsmitjabarcelona.com. An application by fax, phone or e-mail is not possible (except for wheelchair users). On the two days before the Mitya half marathon, you can pick up the bag with your start number and the yellow timer chip. The collection point is located in the Organization tent in the Municipal Sports Center Estacio del Nord (Napols, 42-44). The collection point is open on Friday 9 February 2018 from 11.00 - 20.00 and on Saturday 10 February from 10.00 - 20.00. You should bring your passport and registration confirmation. Collection is no longer possible on race day. After 08:00 on 11 February no more starting numbers will be issued. Changing facilities are available on the race day at the Municipal Sports Center.You can easily get to the starting line of the half marathon with the L1 metro line; station "Arc de Triomf." The half marathon starts at 08:45.